SYDNEY (AFP) — Australia's scientific community called for an alternative evolutionary theory known as "intelligent design" to be barred from classrooms, comparing it to spoon-bending and alien abductions. More than 70,000 scientists and science teachers signed an open letter urging Australia's conservative government not to allow intelligent design onto school curricula. The theory, advocated by right-wing Christian groups in the United States, says that complex biological organisms cannot be explained by evolutionary chance alone and must be the work of an intelligent designer. It is not currently taught to Australian school students but federal Education Minister Brendan Nelson, a Christian, revealed in August he had met a group called Campus Crusade for Christ and would support it being taught alongside Darwin's theory of evolution. The scientific community's open letter said it would be gravely concerned if intelligent design was taught in schools. "To do so would make a mockery of Australian science teaching and throw open the door of science classes to similarly unscientific world views -- be they astrology, spoon-bending, flat-earth cosmology or alien abductions -- and crowd out the teaching of real science," said the letter to national newspapers. The letter said intelligent design ignored the basic scientific principle that a theory should be testable through observation or experimentation. "Not being able to imagine or explain how something happened other than by making a leap of faith to supernatural intervention is no basis for any science -- that is a theological or philosophical notion." While creationist are always trying to pick flaws in the evolutionist’s theory, they forget first that their theory has no evidence whatsoever. God never left any evidence of what he had done—all we have is what is. But if we count the Old Testament as evidence than there is indeed problems! Now god did leave lots of fossils as evidence of evolution, and he just so happened to place the more primitive models he made before the more complex one. God also left many ways of dating his creations, and their dates conflict with his Bible record. One of the two must be in error—the Bible or the dating. Secondly he left a record of all life forms being related in the DNA. The more distant two species, families, genera are the more different is their DNA sequencing. Our beneficent god created the predation, the disease, the birth defects, and the parasites. Is this an example of his beneficent and intelligent design? Also if the design was so intelligent, why did he have to keep, like Microsoft, coming out with new & improved models? If you would spend more time reading the bible, and less time dreaming of evolutionary impossibilities," a reasonably adroit creationist would retort, "you would know the answer to your question. It says in Genesis 7:14-16, 'Wild animals of every kind, cattle of every kind, reptiles of every kind that move upon the ground, and birds of every kind - all came to Noah in the ark, two by two of all creatures that had life in them. 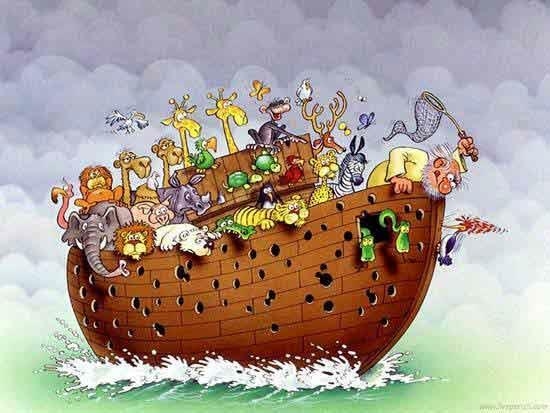 Those which came were one male and one female of all living things; they came in as God had commanded Noah [hopefully, our evolutionist Lochinvar will point out that this contradicts Genesis 7:2,  where Noah is commanded to save "clean animals" by sevens!] , and the Lord closed the door on him.'" It will be pointed out that Noah didn't go out to get the animals - the animals miraculously were directed to come to him. You can't fight with a miracle. Even so, after playing their trump card - magic - many creationists will feel a bit embarrassed over having had to resort to such heavy weaponry so early in the war, and they will strain to find a less unfair argument. In this case, they don't need to think long. "What makes you think that kiwis had to come from New Zealand, and giant tortoises had to come from the Galapagos?" they will ask. "Before the flood, all the different species of animals lived in the same region of the world as Noah did. It was only after the flood that geography changed, and the animal species got scattered all around. Although getting the animals into the ark appears to have been miraculous, it wasn't really that big a miracle." Now of course, the evolutionist can point out that fossil kiwis have never been found outside of New Zealand, fossil kangaroos outside of Australia, and fossil elephant birds have never been found outside Madagascar-Southeast Africa. Our scientist could add that Iraq (presumably the region where Captain Noah and his menagerie began their voyage) is not known for its fossil platypuses or giant anteaters. But the conclusion that the fossil record indicates giant moas had to trek (!) from New Zealand to Iraq to buy tickets for the cruise will be rejected. With icy scorn, the defender of the faith will observe. Of course god can do everything include move animals about, calm their ferocity, make salt-water fish live in fresh water, and find a place on the arc for the over 100 million insect species. That he has done is follows from the infallibility of the Bible.